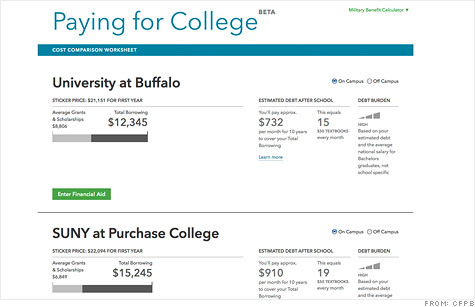 The Consumer Financial Protection Bureau is launching a new online tool to help students compare the cost of college. WASHINGTON (CNNMoney) -- The Consumer Financial Protection Bureau on Wednesday released a new online tool it's testing to help families compare the costs of attending different colleges and universities. The bureau launched the financial aid online tool to help families estimate the cost of a degree at up to three different individual schools. While the tool won't reveal the exact the cost of an education for an individual student, it can help families evaluate financial aid packages offered at each school. On the website, students can plug in the amount of aid they were offered to compare schools. Washington regulators are increasingly focusing on students' ability to afford college in the wake of rising student loan debt, which has topped a trillion dollars. More alarming to officials: Since the recession, more students have been defaulting on loans or have fallen been falling behind in their payments. "Our Financial Aid Comparison Shopper helps students make apples-to-apples comparisons of their offers and pick the one that works best for their financial future," said Richard Cordray, director of the consumer bureau, in a statement. The online tool has data for more than 7,500 state universities, private colleges, community colleges and vocational schools, according to the bureau. Students who plug in financial aid offers can compare monthly student loan payments after graduation. They can also figure out debt level at graduation compared to average starting salaries. While the consumer bureau says their online comparison tool is still in a "test" phase, officials wanted to launch the tool this month. April marks the high point for college acceptance letters, when students must choose which school they can afford to attend.